I like a lot of what Glenn Beck says, but this trip he is taking to the Holy Land is the biggest rip-off ever. No Holy Sepulchre, only the fake Protestant “Garden Tomb.” other key sites are missed! I could go on and on but anyone who pays over $5,000 to go on this trip is getting royally taken advantage of! On top of that it is the HOTTEST month in Israel when no one in their right mind visits in the 100+ degree temperatures! 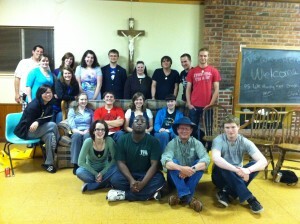 Jesus Will Return May 21, 2011 … Rats! And I Had Plans! Reposted from a month ago – since it will all happen this Saturday!! At least I will be in Jerusalem and see it first hand when he descends to the Mount of Olives! Nut cases never seem to learn from history, or from the Bible for that matter. Jesus said no one knows the day or the hour but the Father alone. History is replete with false predictions, ruined lives and silly calculations. So here we have another one. 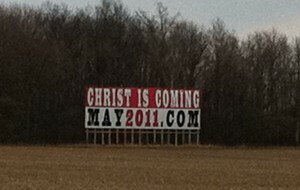 He is so sure of himself that he is posting billboards pronouncing the day Jesus will return. I just HAD to stop on the freeway and get a picture of this. You can see their website at http://www.ebiblefellowship.com/outreach/tracts/may21/ Of course, he is the only one who is right. He has the true interpretation. ALL other churches are wrong and deceived by the Devil. Geez! I WONDER WHAT THIS NUTCASE WILL SAY ON MONDAY MORNING?